Excitement! Independence! Adventure! The waitresses of the Fred Harvey Company were strong, moral-minded, and not afraid of hard work, and rarely did they fulfill their six-month contract with the company, although required to. Most were married a few months into their careers. Known as The Women Who Tamed the West, Fred Harvey was very particular about the type of women he hired. WANTED: Young women, eighteen to thirty years of age, of good moral character, attractive and intelligent as waitresses in Harvey Eating Houses on the Santa Fe Railroad in the West. Wages $17.50 per month with room and board. Liberal tips customary. Experience not necessary. Write Fred Harvey, Union Depot, Kansas City, Missouri. Many of the Harvey Girls were young ladies with no family and no prospects. A job with the esteemed Harvey Company, traveling the railroad, meeting new people, often seemed like a dream come true to many of them. They didn't mind the strict rules and long hours. They were fending for themselves! It wasn't until the Judy Garland movie in the 1940s that most people learned who these amazing women were. Garland romanticized a career choice that was often anything but glamorous. Not when trails pulled into stations with hungry passengers that needed to be fed, sometimes within a half hour. Still, young girls flocked to be accepted into the company. Starting at the bottom, earning points for a job well-done, the girls could work their way up the ranks to the priviledged title of Head Waitress (called Wagon Boss) by some. 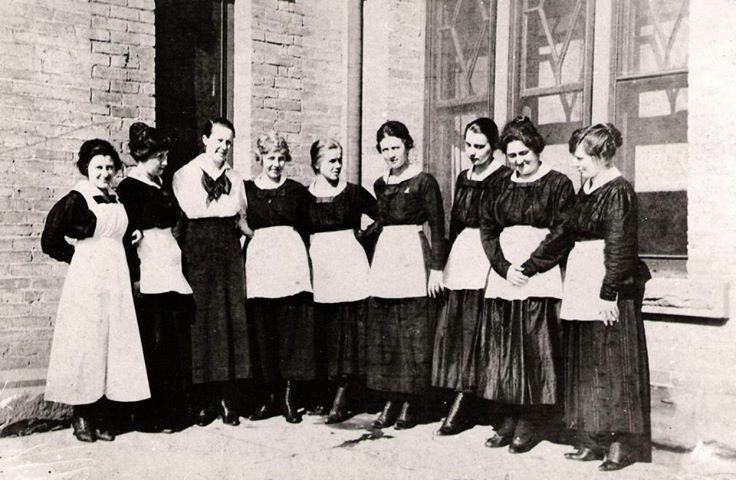 The Harvey Girls made waitressing an honorable profession in a time when many people frowned on women working outside the home. These brave girls cleared a path not only to the west, but for women's freedom. The first of my Harvey books is newly released. Leave a comment for a chance to win Cooking Up Love, Finding Love the Harvey Girl Way. I am excited to hear of the new Harvey Girl fiction books! There is currently a Fred Harvey exhibit going on in Kansas City at the National Archives. Very well done by Dee Harris! I visited it two weeks ago. Also a documentary called Harvey Girls, Opportunity Bound is soon to be released for Public broadcasting stations by Katrina Parks. A very special book about the life of Fred Harvey is Appetite for America by Stephen Fried. I worked for the Santa Fe/BNSF Railway and fell in love with the Harvey Girls almost 30 years ago! I enjoyed reading your article about the Harvey Girls, I will be putting this book on my to be read list. Thank you for the chance to win it. I've always enjoyed reading about the Harvey Girls. I thought they were fascinating and I would have liked to have been one even with all their long hours and hard work. Maybe that was because I loved trains so much. Thanks for another look into their life and work. Being a Harvey probably seemed like an adventure at the time, but I"m sure it was a lot of hard work! A Harvey Girl must of had grit and gumption, what a step of faith to travel west to support themselves. Please add me to the drawing. Thanks! I have read some about the Harvey Girls years ago but not the new ones, glad someone is still writing about them , they were couragous young women and this helped them to have a job that was honest. I didn't realize so many got married soon after but then women were always sought after it seems in that era. I enjoyed your posting. I've read some history about the Harvey girls. They had a lot of courage and faith. Thank you for sharing this Harvey girl history. Your book sounds great. Please enter me in your giveaway. I have read other books about the Harvey Girls and really enjoyed them, thank you for the chance to win this one. I hadn't ever even heard of the Harvey girls until I read about you and Cooking Up Love on Margaret Daley's blog yesterday. Now I'm wicked excited to read your series and watch Judy's movie and research the girls a little bit myself! Thanks for the chance to win a copy of Cooking! Your post was interesting. Thank you for sharing. 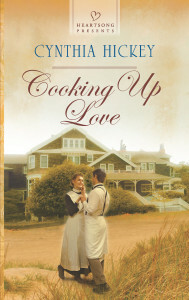 I haven't read anything about the Harvey Girls, so I'd really like to read Cooking Up Love. Thank you for offering an opportunity to win a copy. AND THE WINNER IS....LANE HILL HOUSE!!!! Hi Cynthia, looking forward to reading "Cooking Up Love" and the rest of the series. Cynthia, I started reading your book today. I'm loving it.